I just took a class in this art form at the Vermont quilt festival and highly recommend it for machine quilters. While you might just think of it as art, there's much that crosses over to quilting. It makes you think of ways to fill areas in your quilt with stitching. it was an "out of the box" way of thinking for me and I think I'm hooked! I've seen a lot of that here, but I haven't tried it yet myself. I had to research this .... not sure I could do this on my machine but worth a try ..... someday. What are you doing? I'm looking forward to seeing some of your projects. MaryMo - not all the lines drawn in a typical zentangle would be quilted, but some can be. You would be doing them free motion. It's more the thought process of how to fill spaces than anything else. As for what I'm doing......practicing!!! I love zentangle. All self taught. There is a great website TanglePatterns.com. That collects patterns and how to draw them. I'm doing some placemats that are solid fabrics and zentangles quilted on them. They are a lot of fun. I mark part of the pattern on the fabric and do some of it free hand on the machine. Zentangle.com is a great site and they have an e-newsletter you can sign up for. They have classes to become a certified Zentangle teacher (CZT), and they sell Zentangle tiles. I carry a small artist pad and Pigma pens with me and if I am waiting somewhere, I will pull them out and doodle. One of the quilt guilds I belong to had a CZT come and give a demonstration / class, and it was a lot of fun. I saw the Zentangle booth there, and also took a mini-toot from a gal who came to our Wellness fair at work (Zen-doodling helps with stress). I love the look of some of the black & white fabrics out there that kinda-sorta look like Zentangles. As soon as I get another block of free time, I'm going to try Zentangle FMQ. I used to be guilty of doodling on all my school books. I guess I need to try it with thread and call it Zentangles. Wow, feline fanatic!!! That border is outstanding! that quilt is out of this world and needs to be in a museum or some place of honor!!! There are some great videos on YouTube showing how to do it on quilts. I was lucky enough to take a class with Pat Ferguson, who wrote the book "Zen Quilting." She is a wonderful teacher and I highly recommend both her workshop and the book. love your avatar,it is just beautiful. That boarder is fantastic!!! You must also be a very talented artist to get such fine lines and details. I am very impressed. I have just started long arm quilting and I marvel at your skill. I have a coworker that just loves zentangles, if she has a party I must go. Feline Fanatic: Truly an outstanding border. With that kind of skill you should do a wholecloth. Just Gorgeous. 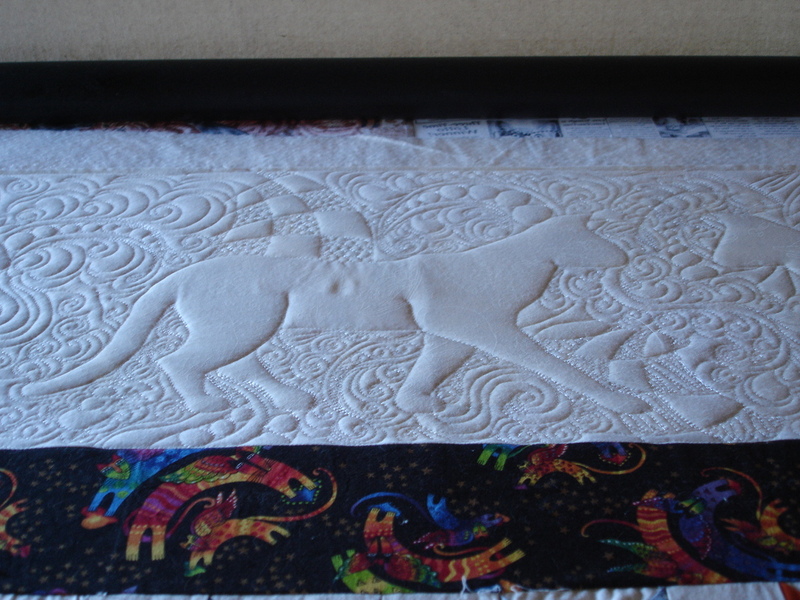 feline fanatic, your quilting is magnificent! I love the look of Zentangles. They are so intriguing and are great "food" for the eye. I've been collecting all of the tanglepatterns from the website in a notebook and have used some of them in a few quilts. I haven't drawn much with them, but I just love the designs. I took a class in it last year at the Houston Quilt Festival and loved it. I find doodling so much fun now as I practice different patterns. I also took one of the Zentangles classes at the Vermont Quilt Festival last week. I really enjoyed it. I do expect to continue with this and to use it when I do quilting. I think it will be great for filling areas. I bought a book about it and have everything together to do some designs on toweling fabric but I keep putting it off to finish quilts or to sew on some clothes. Also have been very busy pulling weeds this year out of all my gardens because we've had so much rain. This has given me the nudge to just do it!! Wow, that is wonderful! I agree, you should do a zentangle whole cloth! This is absolutely gorgeous !! You are a true artist.. ! I found this on you tube about how to draw a zentangle pattern and then quilt it.